India is the land of various religions and cultures, where spirituality still holds great importance. God, being pure, can reveal Himself only to the pure heart and hence a lot of importance is given on purity in various religions. Essential oils are obtained from the various parts of plants using different extraction methods and hence are pure & pristine in nature. Therefore, in ancient era, various essential oils were used in rituals and religious ceremonies for purification as well as for manufacturing a myriad of religious products. Thus usage of essential oil in the religious products goes back to ages. It has also been described in the religious scriptures, that each fragrance has a distinct spiritual meaning and helps create a link between Humans and God. These assist in getting rid of negative emotions and maintaining the spiritually balance mood. Moreover, these are also used for the purpose of meditation and concentrating the mind on God. In sum, these essentials oils have been proved extremely beneficial for keeping step on the path of spirituality. Essential oils find usage in a wide range of religious products including incense sticks, dhoop sticks, hawan samagri, which are extensively used by religious people for the worshiping of their beloved God. 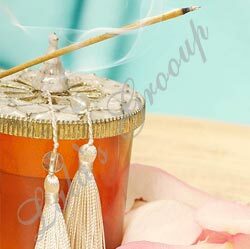 Apart from this, these are also used for creating pure ambiance and used as a room fragrance. Lemon Oil- Lemon oil helps in soothing as well as relieving headaches & migraines and is very helpful for treating rheumatism and arthritis. Bergamot Oil- The oil is used as a constituent for Intestinal Parasites, Nervous Eczema, Stress, Fear, Anxiety, Depression and Tension. Atlas Cedar- It finds application in treating ailments like Acne, Bronchitis and Cellulite Reduction. Basil Oil- It is used for inhalation, in baths and for massages. Rose Oil- The Rose Oil finds wide usage in the perfumery and cosmetics industry because of its innate fragrance and beautifying properties. Lotus Oil- Having good therapeutic and stimulant properties, the oil is associated with arousing love as well as helps in increasing sexuality, fertility and longevity.